Green Bay Packers quarterback Brett Favre is expected to miss a total of three practices, one today and two tomorrow as he attends the funeral of a in-law. Rocky Byrd, the second husband of Favre&apos;s mother-in-law, died of a heart attack on Saturday in Mississippi. 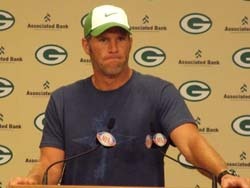 Favre missed practice Sunday morning while he attended to family issues. He&apos;s expected to leave for Mississippi this morning and return on Wednesday night. Rocky Byrd was close to Brett, often times catching passes for Favre&apos;s offseason throwing program.